The dedicated drums version of the award-winning music app is here! Create stunning drum tracks for any song in minutes with SessionBand – the world’s only chord-based audio loop app. Containing over 800 precision-cut, 5 channel drum loops played by Ralph Salmins – one of the world’s top drummers, SessionBand Drums – Volume 1 is the fastest way to create studio quality drum tracks – wherever you are and whatever your ability. And with a host of pro features like automated 5 channel mixing, real-time tempo shift, one-touch live recording and Audiobus compatibility – allowing you to seamlessly export our unique content into other top music apps like GarageBand – it has never been easier or quicker to create your own studio quality music even if you can’t play a note! This is a unique app for musicians, producers and anyone who wants to quickly create professional drum tracks. Note: We recommend using this app with iPad 2, iPhone 4S or newer devices (iPhone users please note: due to compatibility issues with Audiobus 2.1.16, we strongly recommend the use of headphones while connecting to Audiobus for best experience). * All 800 loops have been recorded exclusively for SessionBand by Ralph Salmins – one of the world’s best session drummers – 3 times nominated as a ‘Top 10’ drummer in the Rhythm Magazine poll and voted Best Drummer at the British Jazz Awards. Ralph continues to perform with some of the biggest names in music including Stevie Wonder, Elton John, Madonna, Wynton Marsalis, Van Morrison, Paul McCartney, Burt Bacharach, Quincy Jones, Robbie Williams, Paloma Faith and The Waterboys… to name just a few. He is also credited with performing on over 100 movie soundtracks! Don’t settle for an app that gives you programmed drum-like sounds, use a real drummer for composition, jamming, teaching or your own releases. With Drum Loops HD 2 (as with Drum Loops HD) you have a live drummer right in your back pocket! And in GB he plays exactly at your desired tempo, grooves and fills! In this totally new app: Blues/Reggae/Rock/Bossa/Samba/Fusion and Super Dry Loops (incl. full Audiobus and Inter App Audio support). The ultimate younger brother of Drum Loops HD (released 2013 and frequently updated). Perfect for, producers, teachers, songwriters……more than 700 loops, fills and samples in 7 new styles in many, many tempi, more fills and loops than ever before!. Copy any loop to any paste equipped DAW and compose your own track with anything you could ask from a studio drummer in no time. If you use GB as your DAW of choice you get an incredible advantage, you can copy a loop or fill into GB and from there on change the tempo anyway you like without losing audio quality and maintaining the feel of the drummer! Sing a beat and have it automatically and instantly converted to a drum machine beat! The revolutionary VoxBeat analyzes the kick, snare and hat sounds that you sing, and assigns high-impact stereo drum samples to your beatboxed kick, snare, and hat sounds. It’s amazing and intuitive. It is the easiest and fastest way to program beats: just sing them. You can also just touch the screen to enter or correct drum hits, in real time. Plus you can add audio tracks to capture your ideas. Make a beat, sing a bass line, sing a melody, mix, add effects if you like. Then you can export to WAV or AudioCopy, or link to another app via Inter-App Audio. Email your ideas or import via iTunes. RoughCast is a rhythm machine accompanied by a simple chord playing feature. You can make a quick song sketch with it. For songwriting, analyzing, and making play-along tracks. Drummy is a creative beat production tool. 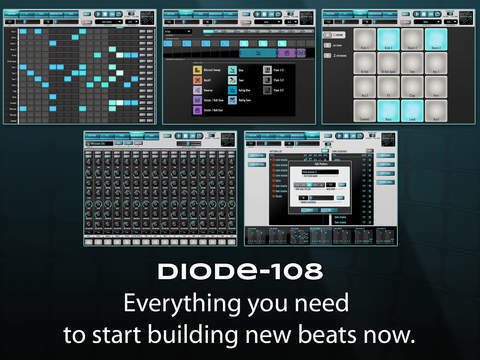 With its intuitive workflow and designed simplicity, its so easy to make inspirational beats. Many people under the impression that the art of producing music using beat maker software is something complicated, and takes too long to learn. But the reality is you can start producing music in a matter of minutes. Drummy has made it possible for anyone to make beats. There is almost no learning curve at all. You’ll be making the same types of high quality beats as the best Musician or DJ performance……You are not going to believe how easily you’ll be able to become a professional beat maker. 11 Drum Kits and Sound Effects covering the most popular modern music styles : Vintage Kit, Analog Kit, Acoustic Kit, Classic Kit, Electro Kit, Techno Kit, HipHop Kit, Urban Kit, Funk Kit and Percussion Kit. An integrated 8 track mixer to balance your tracks to perfection. Mix the volume on individual channels and act as a visual reference of your beat. Our 16 steps sequencer makes it easy to edit your masterpiece fast, a ultra-simple yet highly intuitive interface allow you to tap out a quick beat without the headache that comes when learning other complicated Apps. You can play your drum performances on 8 fully custom pads. Download Drummy and start making your own beats. The best way to learn is just start doing it. If you want to learn rhythms like quintuplets, septuplets and similar, you will enjoy TUPLET TRAINER. TUPLET TRAINER is based on a simple method for learning tuplets. The method is based on intuition and has been tested on and used by students for more than two decades now, and has proven to be extremely effective. Once you master the method, you will easily perform any tuplet with full control thanks to the reference rhythm. You can operate the app either in Listen mode or Practice mode. In Listen mode you can listen to the reference rhythms transform into tuplets. In Practice mode you can set up different configurations for practicing. You can select from 28 tuplets in 4 time signatures, each with multiple motifs, all in all allowing thousands of combinations. Add a groove (hi-hat and bass drum) to reinforce the feel of the time signature. Select different sounds and patterns for the metronome, grooves, and pads. As a musician, composer, arranger, or teacher, you will easily gain access to new exciting rhythmic building blocks that have been very inaccessible before and therefore almost non-existent in western music. Practicing tuplets with this method will not only expand your rhythmic vocabulary: some interesting side effects include a sharper sense of timing, re-phrasing, and subdivision. If you are a stranger to 5/4 and 7/4 (meters), practicing the reference rhythms/tuplets in those time signatures is an excellent way to get acquainted with them. And – you will open up doors to further rhythmic possibilities! 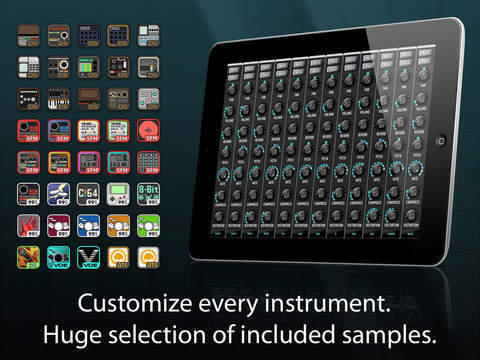 AirPads is the ultimate, simple MIDI drum and sample controller for iOS. Trigger samples in your favourite music program on your computer or device at the speed of hardware. AirPads provides a set of pads for triggering samples and knobs to control parameters in real-time. Simply load the app, connect it with another app on your device or your computer via Bluetooth, and start playing! AirPads utilizes iOS 8 Bluetooth MIDI LE technology, which allows for latency comparable to wired hardware. AirPads is optimized for use with DAWs such as Ableton, Maschine, Logic Pro, FL Studio, Reason, Reaper, or any other MIDI-accepting program with sample-triggering features. 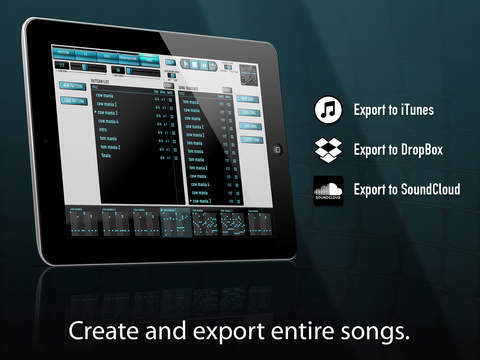 AirPads can also be used for playing melodic instruments such as VST synthesizers and other iOS apps such as Animoog. * Every voice has PER BEAT control of pan, volume, tone, pitch, decay, compression, and distortion, delay, and reverb. Developer: Vibrant Digital Engineering, Inc.